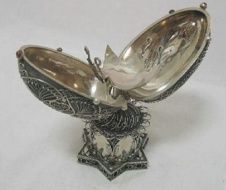 Since ancient times silver was the preferred material for making the Kiddush cups, Hanukkah lamps, Torah decorations and the dozens of other objects used in observing the 'Mitzvot' (commandments). 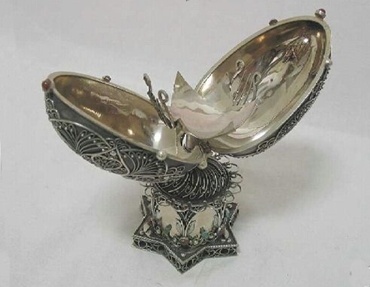 Although silver has been important in the fashioning of secular and religious objects for millennia, very little that was made specifically for Jewish ritual use before the 16th century has survived. 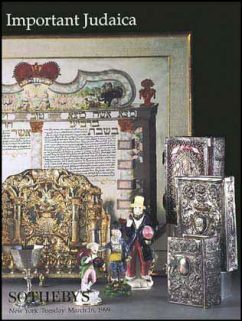 Most of the objects we know of in museum and private collections of Judaica date from the 17th, 18th, and 19th centuries. 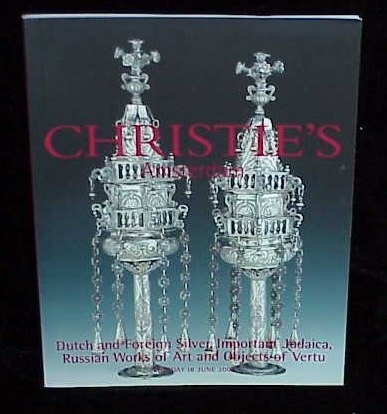 'Judaica' is highly appreciateds by antique silver collectors and Sotheby's and Christie's dedicate specific auctions to this theme. In this article we present a selection of Judaica trays and spice towers belonging to Pascal Jonnaert, a new ASCAS' member from Brussels (Belgium). 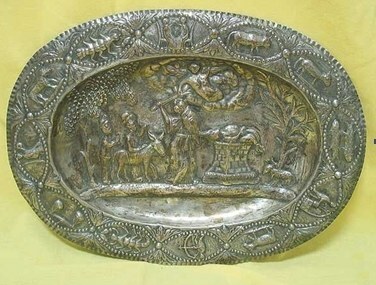 This silver tray representing 'The Sacrifice of Isaac', was hand made by a Jewish artist during the late 18th to the early 19th century in Vienna, Austria. 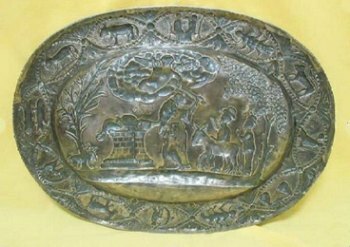 The tray has silver hallmark known as "Alt Vienna" and is very well kept. All over its outer scope are the 12 Zodiac signs in a work of protrusion. In the center is the scene of Isaac's sacrifice and the angel who's calling from above so that Abraham won't touch the boy. The scene is depicted in an exciting work of hammering and is very impressive. 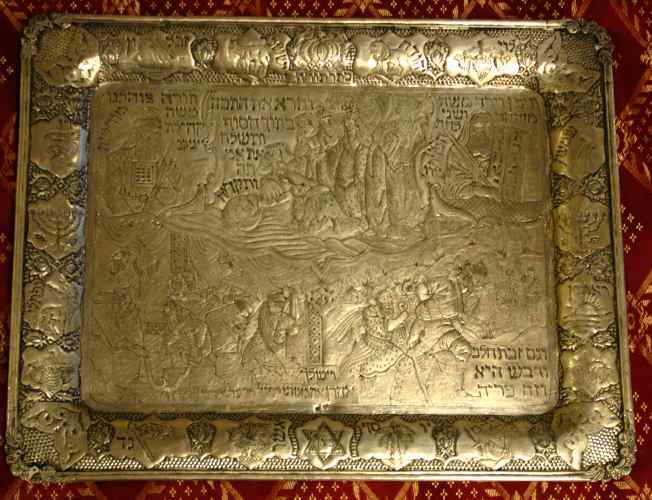 This heavy silver huge tray with Jewish scenes was made in the late 19th century by a Jewish Persian master artist. - Bar Mitsva Ceremony which occurs when the son is getting to the age of 13. Around the rims are embossed the symbols and the names of the 12 tribes of Israel. On the top center a large torah crown and a star of David with the word Zion inside. 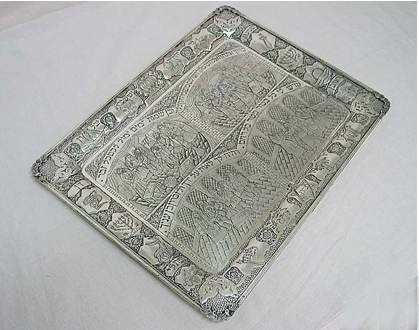 This is a silver huge niello tray Jewish Scenes (Persia, 19th century) is extremely rare and was hand made by master artist around the late 19th century period of time. The tray has been made using hammering and beautiful embossments. It tells a great events in the history of the Jewish nation, the story of Moses and Aaron. First Moses as a baby being found my Miryam in the Nile and his rescue by her. Also the story of Aaron the grand Priest while he visited the Pharaoh in Egypt and showing them the might of Elokim by transforming his staff into a large snake. The story of Moses coming down from mount Sinay with the Tablets of the Law that God gave him for Bney Israel with the Rules, and the story of Aaron when becoming the grand priest in his holy garments with the Hoshen and the twelve tribes gems over it. Also described the story of the spies which were sent to explore the land of Israel and came back with stories on a very fertile and beautiful land , which is the land of Israel. Over the rims embossed the symbols of the 12 tribes of Israel with their names, and on top, a large torah crown, and a Star of David on the bottom. 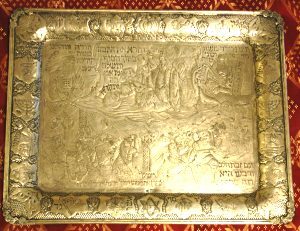 The tray is also engraved with phrases and words from the Torah including blessings in old style of writing. The tray is signed with Persian makers mark and silver marks. Is a special and impressive item which was made by a jewish master artist. The base is designed in the form of a three dimensional David's shield made with an impressive work of filigree. 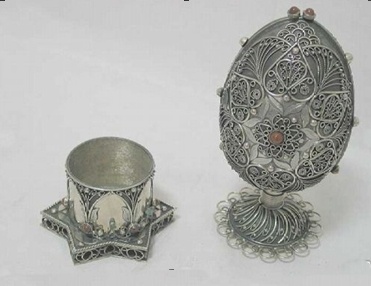 Above the base is a havdala cup with 6 large agath stones inlaid in its base and 5 small jade stones in the patterns of filigree flowers. 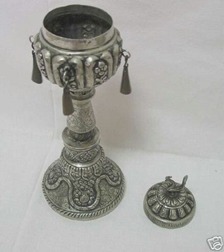 The tower's base fits the cup perfectly and is retractable so that the cup can be used for havdala. The base of the tower is an impressive work of filigree, all over the scope are filigree fans which combine into an impressive David's shield in the form of leaves with engravings and a large agath stone. On the top are two buttons inlaid with agath stones which are used for opening the tower inside which is a base for keeping the spices which is designed in the form of a David's shield. 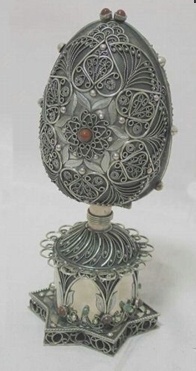 The item reminds Faberg� works of eggs from the late 19thc but in this case it is used for besamim. The quality of the work shows that the artist was a master of these works. The item was brought to Israel by an immigrant from Russia who's grandfather made the item. This Silver Besamim Spices Tower with bells and peacock finial (Iraq, 19th century), was hand made by an Jewish Iraqi master artist. The tower combines an amazing silversmith work with a beautiful work of engraving. On the top of the tower there are 4 long brass bells. The lid opens with a handle in the form of an ornate peacock.